Home › Christianity › Mike Licona’s improbably fishy claim. Mike Licona’s improbably fishy claim. ‹ Hate preacher Lizzie Schofield & the adorable Hatun Tash now operate under the DCCI Ministries banner. Will they follow the example of Jesus? Paul i take great offence at your statement that this tweet is fishy for that assumes a negative connotation to fish food which is generally delicious. For example smoked salmon and grilled sea bass. Yum! How about “dubious” claim? It is also doubtable, odd, questionable, suspect and implausible……. So Paul of Tarsus misrepresented what the scriptures actually said, in order to push his own erroneous theological agenda on the Corinthian Church. Subsequently Christians today, are still pushing the same erroneous theological misunderstandings ABOUT Jesus, “according to the scriptures” (or verses) that never actually existed. That’s an oral tradition dating to decades after the events. Amazing! What is the Isnad on that oral tradition? None? – That’s what I thought. Paul as person is questionable, let alone to question his sayings which turned to be just lies. Defend the founder of your religion by showing us the “scripture” he was talking about. You simply cannot! You worship a human being becuase of that liar! You have wasted your life so far so wake up before there’s no chance for you! if Paul of Tarsus was referring to an oral tradition why didn’t he just refer to the “sayings” or the “traditions” or something similar? Instead, it seems that he intentionally lied and deceived in order to mislead the Corinthians and anyone else who reads his letter. Deception is a sin….and Paul tells us how he regularly engages in sinful lies and deception 1 Cor. 9:19-23 in order to spread the gospel. Isnaad? I told you guys already. You like to try to islamise the bible and play historical criticism games but you still can’t provide an isnad for anything isa of the Koran said. Until you do that, I think it’s far safer to trust an oral creed only decades after the events, composed by eyewitnesses, as opposed to a nomad Arab’s fabrications 600 years later. This guy is so unhealthily emotionally attached to the Bible, he shut off his logic that God created just to say that “scripture” means “oral tradition”. Not according to Paul. Paul emphasized that he got nothing from the true disciples of Jesus rather he got his knowledge directly from heaven. The true diciples of Jesus are ( nothing) according to Paul. Well … There’s a gospel preached in the same time! That gospel was different from the message that your false prophet Paul was preaching. Your false prophet was warning people in that pagan cities of Rome to accept that message even if it’s told by the angles in heaven or even if it’s told by the super apostle. It’s safer to go with the words of Allah(sw). In fact, you have no choice except this path if you want to be successful in the day of judgment ? “[It will be said]. “Were not My verses recited to you and you used to deny them? Our Lord, remove us from it, and if we were to return [to evil], we would indeed be wrongdoers. Indeed, there was a party of My servants who said, ‘Our Lord, we have believed, so forgive us and have mercy upon us, and You are the best of the merciful. Indeed, I have rewarded them this Day for their patient endurance – that they are the attainers [of success].” QT. So Paul referred to ‘oral traditions’ and mentioned them as Scripture in 1 Corinthians 15:3-5. Joel, are you listening ? What a perfect example of an idiotic comment. First, I never said that. Second, and read this carefully, that portion of scripture is according to scholars (note that) an oral creed. That’s not up for dispute. Ask Bilal if you need to. First, this guy’s first knee-jerk unhealthy emotional reply to a scriptural quote that literally says “according to scriptures” was “That’s an oral tradition”, and he now claims to have “never said that.”… Shaking my head again. Ladies and gentlemen, we have entered an endless recursion of baseless source references. Using simple logic, it’s either (1) the scholars are right and Paul is WRONG that it’s scriptural, or (2) it’s Paul who is right, and the scholars are WRONG that it’s oral. Remember, use simple logic. Accepting any and all anonymous writers as Words of God, and accepting even more anonymous oral tradition as evidences goes against any rationality. tl;dr: True faith is reached by using everything that God has given us, rationality and emotion, IQ and EQ. I don’t even understand what you are trying to say. You don’t make much sense for somehow who clearly thinks they are a logician. Paul wrote the oral creed down into his epistle. In logic, this is called a false equivalence: you’ve got no idea. You can’t even read the text or relevant comments related to it. Yu can’t even make coherent statements or objections. It’s an oral creed. The oral creed says that Jesus did those things according to the scriptures, ie in fulfilment of them. That’s how the testimony of Jesus was passed on before the writing of the gospels and the epistles. Now, in the epistle to Corinth Paul is writing the oral creed down. Mike Licona is deceiving himself deliberately ! Shame! Does the Messiah fulfil the destiny of national Israel? Samuel, perhaps you could address my point before discussing the destiny of Israel. 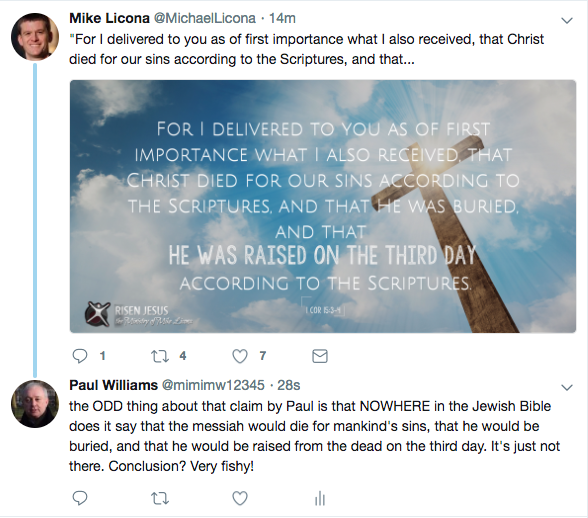 the ODD thing about that claim by Paul is that NOWHERE in the Jewish Bible does it say that the messiah would die for mankind’s sins, that he would be buried, and that he would be raised from the dead on the third day. It’s just not there. Whom do you try to fool here, mr Green? This is not the church for God sake! > Samuel, perhaps you could address my point before discussing the destiny of Israel. I am addressing your point because if the Messiah fulfils the destiny of Israel this directly affects the fulfilment of the Old Testament prophecies. ‘I passed on to you what was most important and what had also been passed on to me. Christ died for our sins, just as the Scriptures said. He was buried, and he was raised from the dead on the third day, just as the Scriptures said‘. I ask you to show me where in the Bible it says these things about the messiah. Nebulous waffle about ‘Destiny’ hardly fits the bill Sam. If you can’t point to credible passages then your religion is based on a falsehood. Its that simple. This has been discussed numerous times before. Many passages have been given to you as evidence but you always just reject them. Why do you ask for something that you will never accept anyway? Why do you demand specific verses saying only what you want to hear but don’t apply to same to the Koran, for example regarding the claim that previous scriptures are corrupted. Don’t you see the hypocrisy in that? ‘Why do you demand specific verses saying only what you want to hear’ you complain. But it is not me who made the claims dude. It’s not my requirement that the Bible must say these things. It is your Paul who informs me of their undoubted existence. that Christ died for our sins, just as the Scriptures said. He was buried, and he was raised from the dead on the third day, just as the Scriptures said. You say many passages have been given in evidence but none fits the bill. Not even close. That’s a fact. You are just being silly. It’s a Jewish oral creed of historical events. Paul was a trained Jewish rabbi. They were much more familiar with Jewish interpretation than you are. Paulus, you just got cornered. Just admit it and leave. We’ve shown Paul the verses he is after countless times before. As I said, the real problem is the Muslim expectation and interpretation. Nothing more. Nothing less. Alright Paulus. Give us the verses again. Let’s talk about it in detail. A sincere discussion would be nice for once instead of the constant back and forth flaming. Well I got news for you little antichrists. If the Quran is true then that means the Bible is true, and because the Bible is true, the Quran is false. We Muslims, we do not worship man, cow God, God Man/Man God, Elephant God, snake God etc. which all become flesh as your God. We worship the God of Jesus, whom Jesus said He(God) is the ONLY TRUE God who sent Jesus and Jesus is not God. Because the only true God is one. Where is our fault here when you cannot find “3 persons 1 God” in the whole Bible but you can find many God is One i.e. We follow the above verses from the Bible. Where is our fault if we followe the above clear verses from the Bible? You, Samaritan do not follow the above verses from the Bible but worship a man, man God etc. whom you think is sinless like a child and can save you just like the pagan Greek/Roman and many idol worshipers sacrifice their babies thinking they can save them because they are sinless. Samaritan, do you think we are fools? and we do not think very well? Probably you don’t. LOL, bad sammie is mad! Apparently, seeing his religion get debunked over and over had taken its toll! This is literally the best we can expect from the xtians: NOTHING! I got news for you little pagan crossworshiper. You’re full of ****. If the Quran is true, then the Bible is true. But if the Bible is true, then the Quran is false. Hmm. what’s wrong this logic? Oh yeah! If the Quran is false, then the Bible is false too by default! What else can we expect from a guy who believes that 1+1+1=1? Your Quran affirms the inspiration, preservation and authority of the Bible. The Bible on the other hand contradicts your Quran and says nothing about a future Arabian prophet. In other words your Quran can vouch for the Bible. Yet the Bible exposes the falsity of your Quran. Hahaha, still mad sammie? It’s okay, dear. I know it hurts to see your pagan cult debunked. Poor, poor pagan. This verse alone is enough to disqualify Muhammad as a false prophet. So, (O prophet,) even if you are in doubt about what We have sent down to you, ask those who read the Book (revealed) before you. Surely, truth has come to you from your Lord, so never be among those who are suspicious. Try reading your cult’s book some time. Another cut and paste job by the pretend-expert! I guess you didn’t read the article by brother Bassam Zawadi. You see you moron, people who actually have read the Quran and Hadiths know that the corruption of the Jews and Christians is well known. When the Quran refers to the Injeel or the Torah, it is not referring to the book of your pagan cult. The true Torah and Injeel were God’a word, not the words of anonymous humans. Dear oh dear, you really do have all the intelligence of an amoeba don’t you? And before you give me any “oh he’s talking about his words in the Quran only” nonsense. Remember you believe the words of Allah in the Quran are uncreated and eternal. This verse is not about the previous scriptures! This verse is us about the ( verdicts) of Allah(sw) as Al Tabari satated. For example, when Allah(sw) has said that believers will go to the paradise, and the disbelievers will go to the Hell. The words of Allah are no going to be changeed to be the opposite. Got it !? The school of the clown seemingly just emits idiots with parrot fashion style of discussion. LOL, you imbecile Canaanite pagan man-worshiper! Do you ever use your last remaining brain cell? Cutting and pasting again? Of course no one change God’s words! His words are with Him. But doesn’t mean that someone cannot corrupt scripture, because even if they do, God’s word are still with Him and He can easily counteract the corruption by renewing the message, as He did when He sent Muhammad (pbuh) as the last prophet and messenger. Why do you worship a Canaanite god, you silly pagan? Why is your savior riding clouds like Baal? Scripture are what make up his “literal words” So if you’re corrupting scripture, then you are corrupting his words and thus changing his message. Honestly, do you purposely play dumb? You really are one absolutely imbecilic little Muhammadan, jumping in again contradicting one of your brothers and making up your own lazy apologetics as you go along. That’s one useless God you’ve got there. A god not powerful enough to stop man from altering his message. Problem is your ignorance is the real issue because your god does indeed declare that he will guard his “reminder” from corruption. The Quran also calls the Torah and the Injeel “the Reminder”. Read the previous verse, snake. In context the passage is talking about ILLITERATE people who have not read god’s previous revelations. The Quran affirms that the Jews and Christians were literate people who knew their scriptures. Once again your subtle attempts at taqiyya backfire and fail miserable. Try another lie. ROFTL, bad sammie is really pissed! I guess being exposed as a pretend-expert really hits his pride! Listen carefully now. The verse you appealed to does not prove that you heretics cannot change the scripture. History shows that you did indeed. The Quran states that you did. Even your Bible says it! See Jeremiah! But even when you heretics changed the scripture, God’s words remain as they are and are in fact renewed as He wills. What brother Abdullah said is also accurate, because God’s decrees cannot be changed by anyone. So if He allows heretics like you to change the scripture, that is His decree and He will allow it to test the believers when the teachings are renewed. Get it? Now go back to worshiping your Canaanite god. I don’t think you quite understand the dilemma you’re facing here. In the so-called uncreated eternal words of your god He explicitly states that none can alter his words. You as a Muslim believe the original Torah and Injeel contained the words of this Allah. Yet here you are going against the declarations of your god and insisting that the Torah/Injeel we have today is a corrupted/fabricated text and the original has been lost. Now you either have to accept that the bible we have today is uncorrupted by remaining true to your Quran which affirms the inspiration, preservation and authority of the Torah & Injeel, and in no uncertain terms states that your god’s words are unchangeable, in which case that would mean your Quran is false. Or you can be a heretic and contradict the declaration of your own god and carry on insisting he’s CAN and WERE changed. Which is it going to be, QB? His words* not He’s…that should be. LOL, no I think you are confused bad sammie. That happens when you blindly cut and paste. God’s decrees cannot be changed by anyone, stupid. But that does not mean that heretics cannot try to bring changes to the religion of God. It’s like if God says don’t do something, and then some heretic comes along and says “well, what God really meant was do it…” we would condemn the heretic as trying to change God’s word. And indeed he is, but we know what God actually said, so we can easily recognize the falsity of the heretic. The same thing happened with your Bible. Heretics came along and made changes to the scripture and called it “inspired” scripture. But God counteracted the heretics by sending prophets, culminating with the final prophet Muhammad (pbuh) to settle the matter once and for all. A perfect example of this can be seen in your Canaanite god. He is a tribal god, who has human features, which is a clear evidence of heretical ideas being inserted into the pristine monotheism of the Israelite prophets. You worship this old man from Canaan, but we know that this is not God. See? God set the matter straight! Alhamdulillah! Oh now it’s his decrees that can’t be changed LOL. You initially argued it was his words that cannot be changed, then it was his scriptures, now it’s only his decrees. Constantly moving the goal posts is not doing you any favours here. Paulus is right, you just rehash old Islamic apologetic website arguments and pawn them off as your own, without really properly understanding the content and the implications of what you’re appealing to. In other words you don’t really fully understand what you’re talking about, do you QB? 👆NONE CAN ALTER HIS WORDS!!!! Where does it say anything about decrees? You repeat your ignorance again. These versrs do not talk about scriptures. Let me explain further for you, when God says he is not a man, then he is not, and he will not be! No one can change this because God has already stated his words about this matter. Scriptures, on the other hand, are another issue. It can be changed by your hand intentionally or by mistake unless God promises to preserve it as the situation with Qur’an. The argument of the clown is stupid … really stupid. LOL, it says the word has been fulfilled. In other words, whatever God decrees, it is done, and no one can change that. Bad sammie is actually guilty of the very thing he accuses others of doing, which is rehashing old arguments. The guy just cuts and pastes in a vain effort to appear knowledgeable. Hey sammie, you imbecile! Why don’t you defend your belief in a Canaanite god? Since when was God an old man like El? Since when was he a storm rider like Baal? All of these beliefs are borrowed from pagan mythology. It is proof-positive of the corruption of the pristine monotheism of the prophets. God’s decrees cannot be changed, and neither can His words. What He says will remain, even if heretics try to corrupt it. He will expose their corruption and replace their falsehood with truth. Uhh actually yes they do. Yes. So a bit like when your god says none can alter his words, then no one should ever be able to alter his words. Especially when he also promises to guard his revelations from corruption. But you Muslims disagree. You don’t seem to share your god’s confidence. You believe your god was powerless to prevent man from altering his previous revelations to the point of making them all but unrecognisable. Show me where it makes the distinction between the “Quranic definition” to the Torah/Injeel we have today. I don’t knell during the consecration or genuflect in front of the cross largely to avoid shirk. But I do stand at points in the liturgy. Where does it say that in the Jewish Bible? Well, I suppose I was pointing out that it wasn’t Licona that originally said it, but I just recalled it from the Nicene Creed.